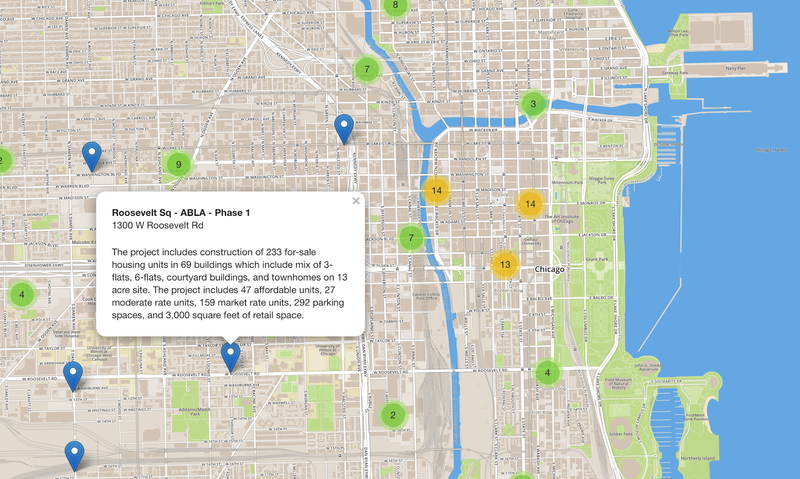 The open-data site Chicago Cityscape has mapped hundreds of construction projects receiving public support through the city’s increasingly controversial tax-increment financing (TIF) system. A common economic development tool for municipal governments, TIF can incentivize construction projects by offsetting a developer’s property taxes. But as numerous in-depth reports from the Chicago Reader have made clear, in Chicago the program has historically been used more like a slush fund for the mayor’s office, with money often landing in the coffers of downtown projects instead of the economically depressed areas where it’s supposed to spur job growth. In 2011 Mayor Rahm Emanuel campaigned in part on improving government transparency, vowing less than one week into his first term to return TIF “to its roots.” Controversial TIF awards continue to emerge, however, accumulating predominantly in the city’s central business district as the mayor gears up for his second term. Chicago Cityscape’s map is accompanied by a spreadsheet of public city data sortable by project name, approval date, TIF assistance amount, total project cost, ward, and community area. In all there are 379 entries displayed, but that excludes projects listed by the city in another data set—the City of Chicago TIF projects portal shows TIF projects through other agencies, such as the Chicago Department of Transportation.